While body language experts debated whether Marko Arnautovic was waving goodbye or thanking the crowd for a warm round of applause after his substitution in the second half, it was a day when the limelight ended up shining on the local lad who has been earmarked as the leader of West Ham�s next generation. 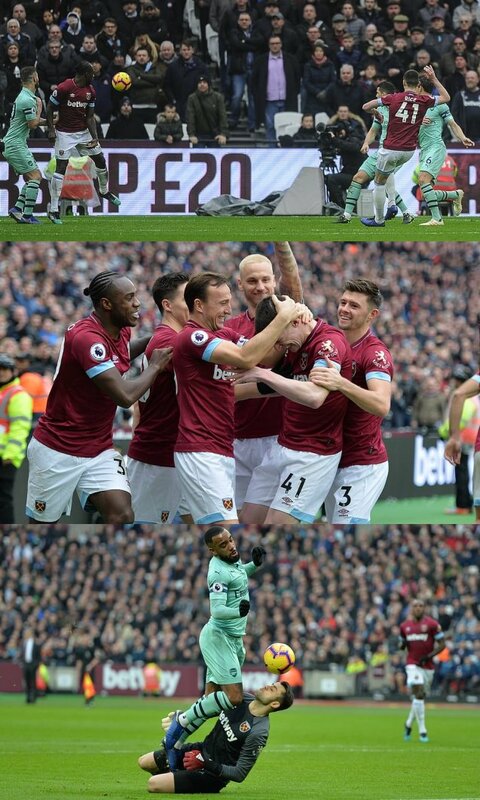 After all the fuss over Arnautovic�s desire to take a lucrative offer from an unnamed Chinese club, the biggest roar here was reserved for the moment when a crisp finish from Declan Rice gave West Ham the edge over one of the blander Arsenal sides in recent memory. They have a rich heritage of producing their own in these parts and there is no doubt that they have unearthed a gem in Rice, a youngster whose maturity continues to take the breath away. To put his rise into context, the defensive midfielder�s first senior goal arrived two days before his 20th birthday. Rice�s latest immaculate display underlined why West Ham tied him down to a new long-term deal last month, not to mention why he is coveted by England and the Republic of Ireland. Rice was everywhere, frustrating Unai Emery�s toothless side with a series of unfussy interventions, and it is unlikely that anyone in claret and blue will score a more popular goal this season. Ever the showman, Arnautovic bleached his hair for the occasion. Yet this was a subdued performance from the Austrian, who went off with pain in his back for the second successive week, and the early threat emanated from Arsenal. The visitors almost scored when Alex Iwobi played Alexandre Lacazette into space vacated by Angelo Ogbonna, only for Lukasz Fabianski to deny the forward with a fine stop. Emery criticised his players for failing to impose themselves on West Ham and, following their manager�s recent admission that he has funds for only loan signings this month, it was impossible not to feel that Arsenal have got themselves into an unenviable bind when it comes to Mesut �zil. He did not even merit a place on a bench containing three full-backs and a 19-year-old forward, Eddie Nketiah, who has never started a Premier League game. �zil is Arsenal�s biggest earner by a considerable distance. Was it not a luxury to travel to West Ham without a player on �350,000 a week? �The players that were here were the players that deserved to be at this match,� Emery said. Yet Arsenal have taken two points from their previous five away games and their failure to score in the league for the first time since the opening weekend exposed their creative deficit. West Ham were the stronger side in the final third, with Felipe Anderson�s quick feet causing problems and Samir Nasri determined to silence the constant taunts from the away end. The former Arsenal midfielder was influential in the No 10 role and produced the assist for Rice�s goal. Slack defending led to the breakthrough in the 48th minute. Anderson skipped round a lacklustre challenge from Lacazette and when Granit Xhaka met the winger�s cross with a lazy header, Nasri fed a composed pass to Rice, who swept a shot high to Bernd Leno�s left. Emery responded by replacing Xhaka with Aaron Ramsey and switching to a back four, Shkodran Mustafi making way for Lucas Torreira. There was a brief flurry from Arsenal, Iwobi threatening, Pierre-Emerick Aubameyang firing over. Those were isolated moments, though, and Aubameyang spent most of the game pining for the kind of service �zil could have provided.